Bahrain Bay: what differentiates it from Manama's other developments? We can all agree on the vital role which the Bahrain plays as a major trade hub in the GCC; the kingdom does not only enjoy a strategic location in the Arabian Gulf, it is also a densely-populated cosmopolitan nation. For these reasons and more, there has been a growing interest in the opportunities of investment in Bahrain in the recent years. Last year, we wrote an insight regarding the status of the environment of investment in Bahrain in 2018. We focused on the opportunities as well as the obstacles that challenge Bahrain’s potential for attracting investors and businesses, according to the World Bank report on the easiness of doing business in Bahrain in 2018. Now, we take a look at the progress that took place in a year in the environment of investment in Bahrain; we will discuss the changes in Bahrain’s rankings in the indicators that determine the easiness of doing business in it. Overall, the Kingdom of Bahrain was ranked the 62nd easiest country to start business in in 2019. This reflects a positive progress from last year, where Bahrain scored the 66th rank in the same index. That being said, let’s take a closer look on each indicator that calculated the aforementioned rank. The report views the sub-measures of the indicators in comparison with Bahrain’s region, Middle East and North Africa (MENA), and the member countries of the Organization for Economic Cooperation and Development. We will compare the result of each indicator on relative basis (how Bahrain’s rank for the indicator rank among the 190 studied countries changed last year) and absolute basis (how Bahrain’s score in each indicator changed last year). This is for measuring the extent to which starting business in the concerned country is facilitated. The research that was performed on Manama, the capital city of Bahrain, concluded that 6 procedures are required to start a business; while this is more than the average of OECD (4.9 procedures), it is less than the average of MENA (7.2). The procedures take around 8 days and cost 1.1% of income per capita to be completed. These numbers are lower than the average time and cost for both MENA (20.5 days, 22.6%) and OECD (9.3 days, 3.1%).Note: it is vital to mention that in case the applicant was a female, the numbers change slightly. In particular, there would be one more procedure that needs to be completed (i.e. obtaining husband’s permission to leave home). Naturally , one additional calendar day would be needed to complete that procedure (9 calendar days). As for the minimum capital required to start a company in Bahrain, it has been computed to be 250BHD. Change in rank: the Kingdom of Bahrain has jumped 9 ranks up in the Easiness of Starting Business index. Change in score: Bahrain scored 89.57 in the Starting Business indicator, 1.7 points higher than the score of 2018 (87.87). Change in sub-indicators: Bahrain has now 1 less procedure than 2018 for starting business in it; naturally, this led to reducing the time needed to complete the procedures by 1 calendar day as well. 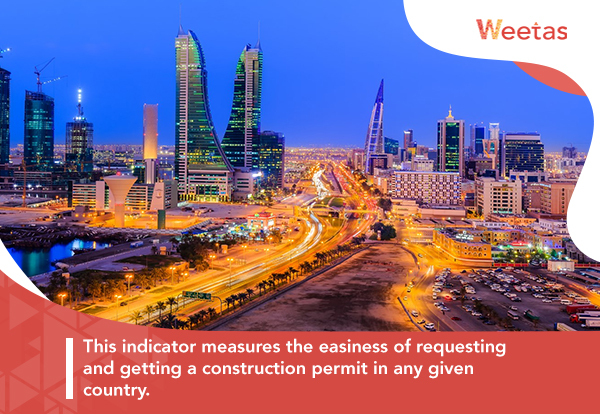 This indicator measures the easiness of requesting and getting a construction permit in any given country. As per the report, 11 procedures need to be completed to get a construction permit. This is less than the average number of same procedures needed in both MENA (16.6) and OECD (12.7).However, these 11 procedures take 174 days and cost 3.9% of the property value. The duration is longer than the average procedure completion duration of MENA (137 days) and OECD (153 days). On the other hand, the cost percentage is lower than MENA (4.7%) and higher than OECD (1.5%). b) Building Quality Control Index:As for Building Quality Control Index, Bahrain scored 12.0 out of 15, which is very slightly lower than MENA’s average (12.1) and higher than OECD (11.5). Change in rank: the Kingdom of Bahrain dropped by 10 ranks when it comes to the easiness of dealing with construction permits. Change in score: Bahrain’s score for construction permits dropped merely by 0.33 points from 73.73 in 2018 to 73.40 in 2019. Change in sub-indicators: with the exception of a small increase in the cost percentage from 3.7% in 2018 to 3.9% in 2019, nothing else has changed; even the building quality control index score remained at 12 points. The drop that took place in the ranks is probably attributed to the relative comparison; other countries have improved its performance and therefore jumped over the rank of Bahrain in 2018. 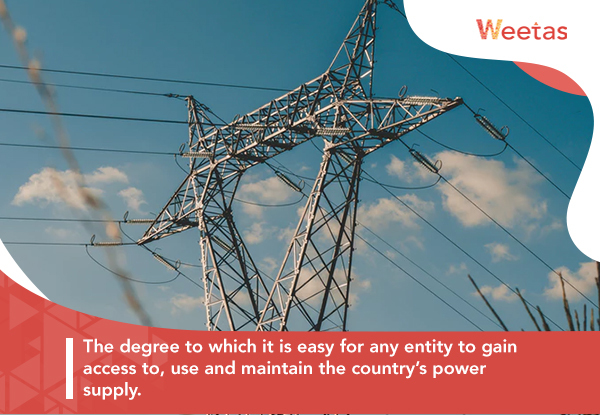 The degree to which it is easy for any entity to gain access to, use and maintain the country’s power supply. The number of procedures needed to gain electricity connection was found to be 5; this is higher than the average for both the MENA and OECD countries (4.7 and 4.5, respectively). In more details, the procedures take around 85 days and cost 61% of income per capita. The duration needed is higher than that of both MENA and OECD (72.4 and 77.2 days respectively). However, the cost of completing the procedures in Bahrain is lower than that in MENA (480%) and OECD (64.2%). The Kingdom of Bahrain scored 5 out of 8 in the index of reliability of supply and transparency of tarrif, a higher score than that of MENA and lower than that of OECD (4.2 and 7.5 respectively). Change in rank: the easiness of getting electricity in Bahrain went slightly downwards by 3 ranks. Change in score: The score of getting electricity in Bahrain almost stayed the same as it dropped only by 0.01 points from 74.83 in 2018 to 74.82 in 2019. Change in sub-indicators: Bahrain’s procedures and time to get electricity remained unchanged between 2018 and 2019. However, the cost percentage has surged up by 4% from 57% in 2018 to 61% in 2019. The extent to which it is easy for a business to register its property in the studied country. 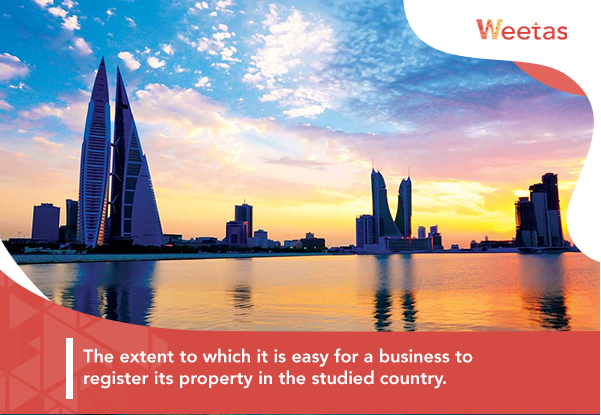 The number of procedures needed to register a property in Bahrain was found to be 2. This beats the number of both MENA (5.6) and OECD (4.7). That was not the case, however, for the time of finishing the procedures, which was estimated to be 31 days; meanwhile, time for completing MENA’s property registration procedures is 29.7 days while OECD’s duration was found to be 20.1 days. As for the cost, which is calculated as a percentage of the property value, it was found out to be 1.7% in Bahrain; once again, this is smaller than the cost in MENA (5.7%) and OECD (4.2%). Out of 30, the Kingdom of Bahrain scored 17.5 on the Quality of land administration index; a score that is higher than that of MENA (14.2) and lower than that of OECD (23.0). Change in rank: this is the slightest shift that took place in the indicators measuring the quality of investment in Bahrain; it has decreased by only 1 rank. Change in score: Bahrain’s score in registering property indicator remained the same at 81.07. Change in sub-indicators: as Bahrain’s unchanged score and almost-unchanged rank might indicate, no changes have taken place. The procedures, the required time for their completion and their cost in addition to the quality of the land administration index are exactly like 2018. This calculates the degree of easiness of getting credit the studied country. This sub-indicator is meant to measure the degree to which the rights of borrowers, lenders and secured creditors are protected. Unfortunately, Bahrain scored 1 out of 12 in that sub-indicator, lower than both the scores of MENA (2.2) and OECD (6.1). This is meant to measure the scope and accessibility of credit information provided credit bureaus and registries. Unlike the first sub-indicator, Bahrain has successfully scored a perfect 8 out of 8, higher than both MENA (5.1) and OECD (6.7). The percentage of Bahrain’s adult citizens and firms which the kingdom’s credit registry covers. Strangely enough, the research revealed that the credit registry covers 0.0% of the targeted segments. Needless to say, this is lower than both MENA (14.7%) and OECD (21.8%). The percentage that Bahrain’s credit bureau covers of the adult Bahrainis and Bahrain’s firms; this was revealed to be 28%, higher than the coverage of MENA (15.5%) and much lower than the average of OECD (65.3%). Change in rank: Even though its score remained the same, Bahrain’s rank in the easiness of getting credit indicator dropped by 7 ranks in 2019 from 2018. Change in score: Bahrain’s score in easiness of getting credit remains unchanged between 2018 and 2019 at 45 points.Change in sub-indicators: as the indicator’s score shows, almost none of Bahrain’s scores in the sub-indices have changed; the only exception of this is Bahrain’s credit bureau coverage which grew by 0.2% from 27.8% in 2018 to 28% in 2019. 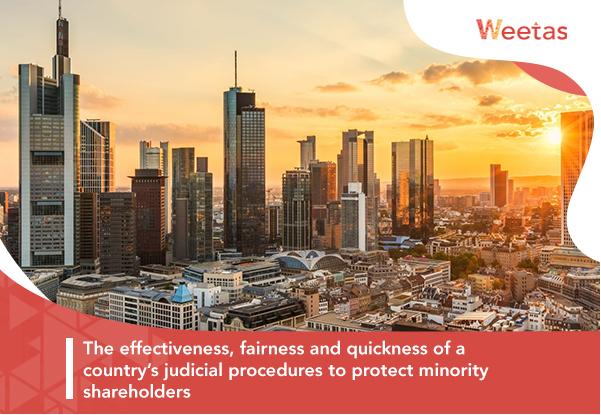 The effectiveness, fairness and quickness of a country’s judicial procedures to protect minority shareholders against the misuse of corporate assets by its board of directors. The extent of Bahrain’s requirements for disclosing related-party transactions scored a high 8 out of 10; this is higher than the scores of both MENA (6.4) and OECD (6.5). This measures how much the minority investors can sue and hold any member of the board of directors accountable for prejudicial transactions. Bahrain scored 4 out of 10, lower than both MENA (4.7) and OECD (5.3). This is for determining the level of accessibility to internal corporate documents for shareholders. Bahrain earned a moderate 5 out of 10; a score higher than that of MENA (4.5) and lower than that of OECD (7.3). The measure of the rights and roles of shareholders in corporate decisions, in which Bahrain scored a high 9 out of 10. This score indicates extent of shareholders’ rights in Bahrain higher than both MENA and OECD (5.1 and 6.4 respectively). The strength of laws and regulations issued by the government to protect the shareholders from malicious board actions and decision. Bahrain scored a high 7 out of 10, indicating a stronger performance in that index in both MENA (4.7) and OECD (5.4). The degree of corporate policies’ transparency regarding shareholders’ rights, compensation, and audits. Bahrain earned a score of 7 out of 10, greater than MENA’s (5.8) and lower than that of OECD (7.6). 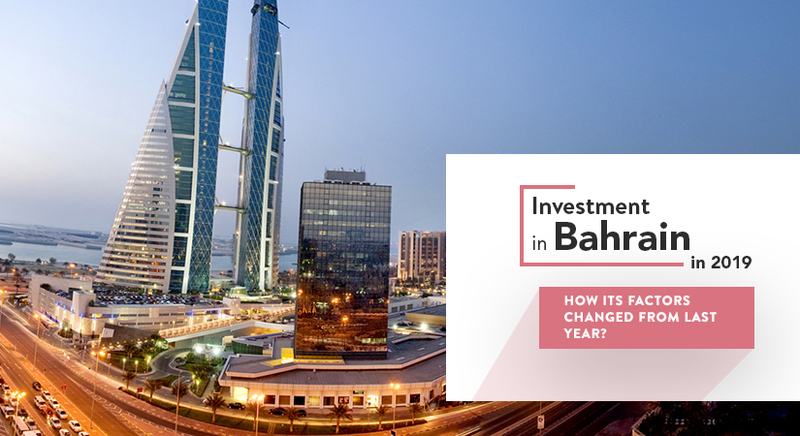 Change in rank: this indicator has witnessed the greatest jump in the ranks of the factors of investment in Bahrain between both years; it increased by 70 ranks from 108 in 2018 to 38 in 2019. Change in score: as expected, Bahrain’s higher rank is attributed to the significant improvement its score in protecting minority investors has witnessed from 50 in 2018 to 66.67 in 2019. Change in sub-indicators: both of the extent of disclosure index and the extent of director liability index remained stable. However, it was the accumulated upsurges of extent of shareholders’ suit index from 4 to 5, extent of shareholders’ right index from 5 to 9, extent of ownership and control from 4 to 7, and extent of corporate transparency index from 5 to 10 that caused the unprecedented jump in Bahrain’s rank from 107 to 37. This indicator is for measuring the levied taxes and all the similar monetary contributions a business is obliged to make to the government of the studied country and how easy or hard it is for businesses to comply to these taxes. The total number of tax types paid and the frequency and method of payments. Bahrain’s number of required tax payments was calculated to be 14. This is considered a moderate number that lies between the averages of MENA (17.7) and OECD (11.2). A sub-indicator that measures and compares the average time (hours) needed to make the required tax payments. In Bahrain, it takes 28.5 hours per year to pay the levied taxes; this is far less than the time needed in MENA (196.7) and OECD (159.4). The percentage of the commercial profits need to make the tax payments. In Bahrain, the tax rate constitute 13.8% from the commercial profits a company would make. Once again, this is lower than the rates of both MENA and OECD (32.7% and 39.8%, respectively). Change in rank: Bahrain’s rank in the top 10 of the index of paying taxes stayed the same between 2018 and 2019. Change in score: among all the determinants of the environment of investment in Bahrain, Paying Taxes in the only factor in which Bahrain’s score remained the same; much like the rank, Bahrain’s earned score in paying taxes remained unchanged at 93.89 out of 100.Change in sub-indicators: As you might have guessed already, the measured sub-indicators did not endure any positive or negative changes. This, of course, further explains the fixed rank and score from last year. 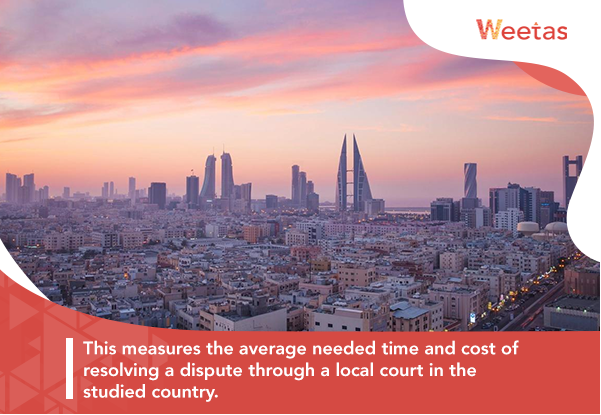 This measures the average needed time and cost of resolving a dispute through a local court in the studied country. This indicates the time a lawsuit would take to be resolved. In Bahrain, a lawsuit would take around 635 days; meanwhile, it would take 622 days in MENA and 582 days in OECD. The sub-indicator that computes the cost as a percentage of the whole claim value of the case. In Bahrain, the percentage was found out to be 14.7%, lower than the percentages of both MENA (24.7%) and OECD (21.2%). Out of 18, Bahrain scored only 2.5 points; this indicated a lower quality of judicial procedures in Bahrain than both MENA (6.1 points) and OECD (11.5 points). Change in rank: Bahrain’s rank in the extent to which the contracts can be enforced during legal disputes dropped by 17 ranks from 111 2018 to 128 in 2019. Change in score: One of the main causes behind the downfall Bahrain’s rank has endured this year is its reduced score in enforcing contracts from 54.53 points in 2018 to 51.75 points in 2019. Change in sub-indicators: The scores of all the sub-indicators have shifted during last year. While the time for enforcing contracts was reduced by 13 days from 635 days in 2018 to 622 days in 2019, the cost has maintained its percentage at 14.7%. However, it was the quality of judicial procedures index that has dropped from 4 points to 2.5 points. This was accompanied with an improved performance of both MENA and OECD in the same index, which mainly explains the 17-rank drop Bahrain has endured. 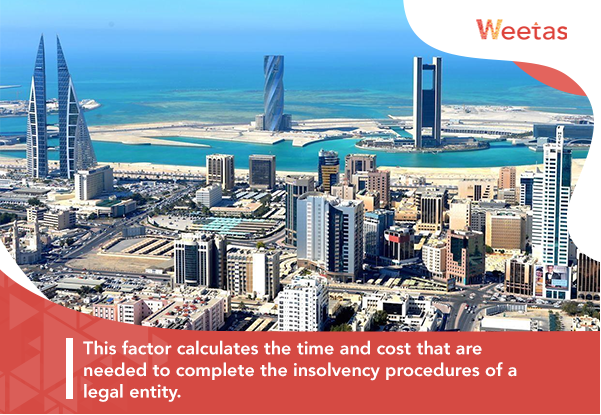 This factor calculates the time and cost that are needed to complete the insolvency procedures of a legal entity. The duration (years) needed to complete insolvency proceedings, which is found out to be 2.5 years in Bahrain, 2.8 years in MENA and 1.7 years in OECD. The cost of completing the proceedings as a percentage of the value of the estate. Research showed the rates to be 9.5% in Bahrain, 13.8% in MENA, and 9.3% in OECD. Calculated as the percentage of cents recovered from one dollar of the estate’s value. In Bahrain, the rate stands at a moderate 42.2 cents, while MENA’s is 26.3 cents and OECD’s is 70.5 cents. The factor measuring the quality of the insolvency procedures. Bahrain, MENA and OECD scored 7, 5.9, and 11.9 out of 16 respectively. Change in rank: The rank of the ease of resolving insolvency in Bahrain dropped by 3 ranks in 2019. Change in score: Even though the ranks dropped, Bahrain scored 44.57 out of 100 in resolving insolvency index in 2019, indicating a very minimal increase from last year’s score of 44.42. This implies that the lowered rank was caused by improved performances of other countries in the index, and not because of a deterioration of Bahrain’s performance. Change in sub-indicators: while both the time and cost of resolving insolvency, as well as strength of insolvency framework index, did not go through any changes, the recovery rate increased slightly from 41.9 cents to 42.2 cents. 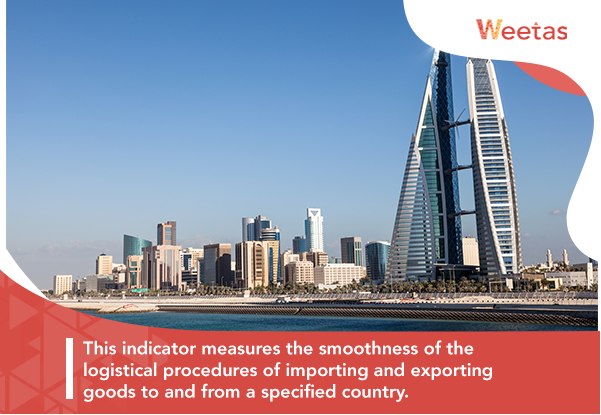 This indicator measures the smoothness of the logistical procedures of importing and exporting goods to and from a specified country. This is mainly calculated in terms of the cost and time taken to do so. This sub-indicator is concerned with measuring the extent of inspections made by customs and other agencies that occur at the border. In Bahrain, border compliance for exported goods was found to take around 71 hours and cost $47. The time was found to be longer than the time of both MENA (58 hours) and OECD (12.5). However, the calculated cost is much lower than the costs of both groups ($442 for MENA and $139 for OECD). On the other hand, in case of importing goods, border compliance takes around 42 hours and costs $397. In this case, both of time and cost for Bahrain stands almost halfway between MENA (105 hours, $536) and OECD (8.5 hours, $102). This measures the time and cost spent to obtain, prepare and submit the needed documents required by both the exporting country (origin economy) and the importing country (destination economy) to complete the trade transaction. For exported goods, document compliance in Bahrain requires 24 hours and $100. Both time and cost are lower than those of MENA (67.9 hours, $244.6) and higher than those of OECD (2.4 hours, $35.2). Meanwhile, document compliance while importing goods needs 60 hours and costs $130. The time is shorter than what is needed in MENA (75.5 hours) and longer than what is needed in OECD (3.4 hours). Similarly, the cost is lower than the document compliance cost in MENA region ($269) and higher than OECD ($24.9). Change in rank: Bahrain’s rank in the index of Trading Across Border saw a very slight improvement from 78 in 2018 to 77 in 2019. Change in score: The score of the ease of trading across borders in Bahrain increased by 1.8 points from 75.97 in 2018 to 77.77 in 2019. Change in sub-indicators: No upward or downward shifts have occurred in most of the sub-indicators. The only exceptions for that would be the time needed for both document compliance and border compliance while importing goods; the time needed for border compliance was shortened by 12 hours from 54 hours in 2018 to 42 hours. Similarly, the time for document compliance dropped from 84 hours in 2018 to 60 hours in 2019. The greatest improvement in the conditions of investment in Bahrain was in the degree to which minority investors are protected; throughout the last year, the Kingdom of Bahrain managed to turn this from a weakness into a strength. Other slight improvements in the conditions of investment in Bahrain took place in trading across borders, mainly in terms of the time needed to import goods, and easiness of starting business, mainly in terms of the procedures and therefore the time needed to launch a company. Despite the variant drops in their ranks, most of the other factors affecting the conditions of investment in Bahrain maintained a mostly consistent performance over the last year. To be specific, these factors were the easiness of getting construction permits, gaining electricity, resolving insolvency, getting credit, and registering property. The only exception for that would be the extent of enforcing contracts which endured a 2.78-point drop. This has been mainly caused by the reduced quality of judicial procedures index. 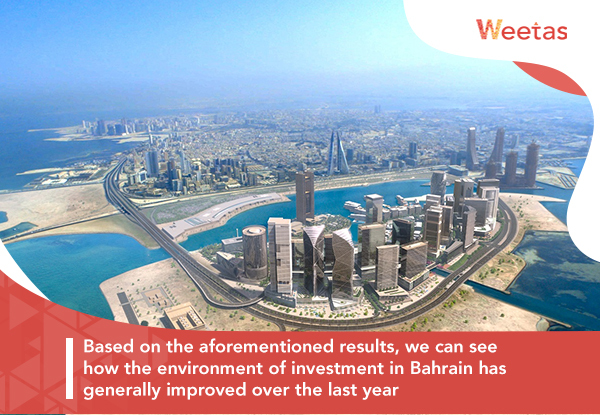 Also, this indicates that this area needs urgent improvements to help improve the status of investment in Bahrain. 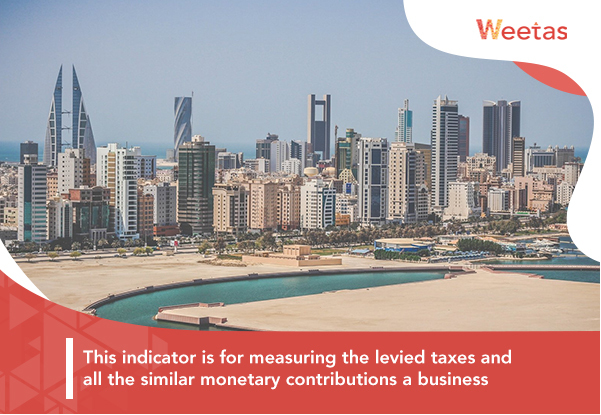 Paying taxes stands out as the one factor affecting investment in Bahrain that did not witness any changes in both its score and rank; the latter remained at a strong 5 out of 190 indexed countries. Overall, it is clear that the reforms that took place inside the island kingdom’s business environment of Bahrain have mostly positively impacted the investment in Bahrain. However, more reforms need to be implemented to capitalize on such momentum and to stimulate the growth of investment in Bahrain over time.